Buying Your First Popcorn Machine? 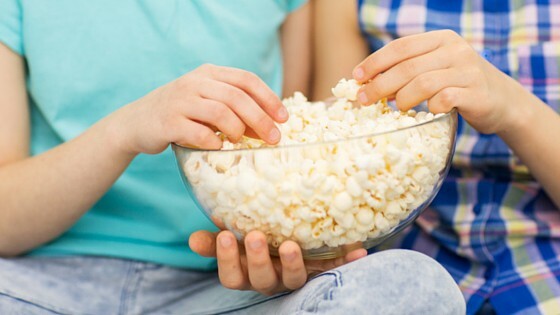 Whether it’s movie night with family or binge watching TV shows by myself – either at home or at the movie theatre – popcorn can not be missing. It has become the ultimate snack to munch on while staring at a screen. 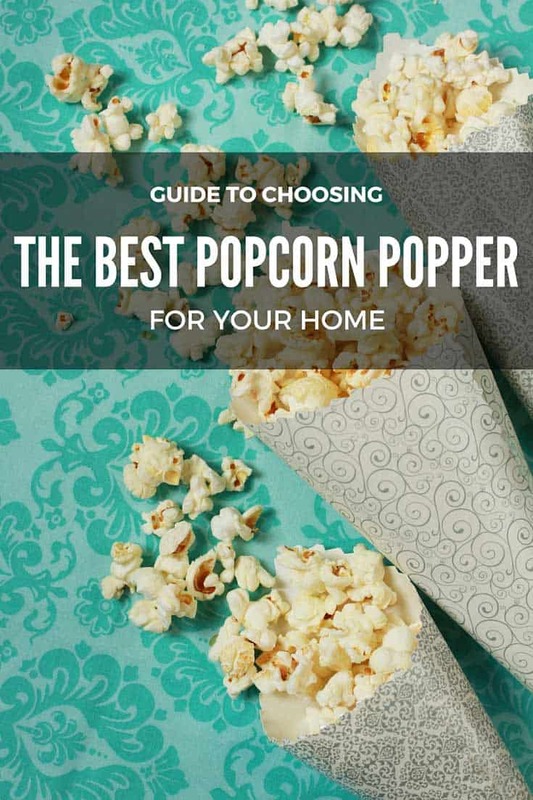 But what are the best popcorn poppers to make your own – movie theatre quality – popcorn at home? In this short guide I will show you the various types of popcorn makers available today. I will be reviewing the top nine home use poppers so you can make an educated decision on which one is the right investment for you. Whether it’s microwaveable popcorn bowl, hot air popper, or even a fancy commercial popcorn machine, they all – ultimately – do one thing: They turn popcorn kernels into popcorn! So whatever popper you pick, know you can not go wrong with any of the recommended ones listed on this page. This comparison chart shows all the top rated popcorn poppers along with ratings from Amazon. 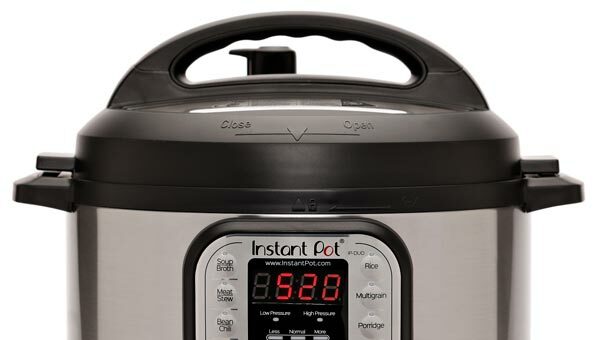 Beneath the chart you will find more detailed reviews of each of the countertop popcorn makers, standalone popper machines, microwaveable popper bowls, and stovetop poppers. The Lékué popcorn maker has got to be the best microwave popcorn maker bowl invented. It is made from silicone, which makes it lightweight and collapsable (from 5 down to 2-inches height) for easy storage. Silicone is also very durable and easy to clean. It is even safe to wash the Lékué Popcorn bowl in the dishwasher. It’s also very easy to fill without requiring a measuring cup. Inside the bowl is a fill line marking the amount of popcorn kernels it can safely pop. I personally was able to get it down to just 4 unpopped kernels (without burning the popcorn) after just my second time using it. Needless to say I am very happy with it! Thanks to the suction lid, there is no worry about popped kernels overflowing and having to be cleaned out from the microwave. 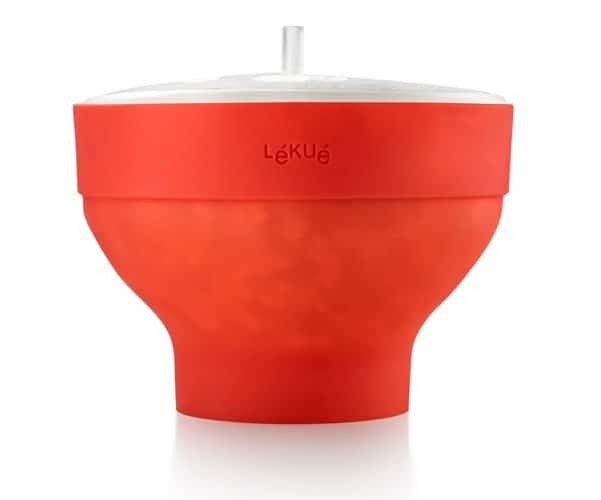 The Lékué Popcorn maker doubles as an attractive serving bowl that holds up to 12 cups of popped popcorn, which is a standard amount among microwave popcorn makers. If you are looking to make large amounts of popcorn regularly, this one may not be ideal for you and I would encourage you to check out some of the machines reviewed below. Otherwise, this would have to be the best and easiest home popcorn maker to use. CONS: Because it’s silicone it bends and folds easily and is not firm like you’d expect from other bowls. Click here to check out the latest price, more details and reviews. 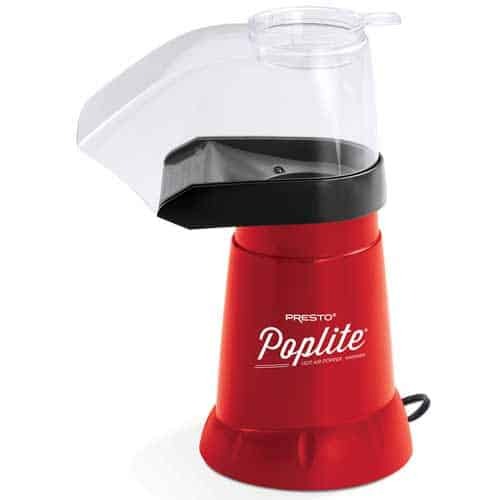 The Presto Poplite is an absolute bestseller not only among hot air poppers but popcorn poppers in general. The huge plus? The hot air technology makes popcorn without any added oil! Because the popcorn leaves the heat source after popping, there is also no risk of it burning (as is quite common in microwaveable popcorn bowls). It also works very quickly. In less than 2.5 minutes it can produce up to 18 cups of popcorn per cycle. The removable butter warmer in the chute doubles as measuring cup for the right amount of popcorn kernels. We’ve been using this air popper in a slightly older version for a long time and love it. The only downside we found are the first few popped kernels running amok in your kitchen. They shoot out at high speed and usually don’t end up in the bowl. To remedy this, we partially cover the air popper with a tea towel at the beginning to help guide the first kernels into the bowl. Although the housing and chute cover are made from plastic, the inside part that ‘cooks’ the popcorn kernels is actually stainless steel. The Presto Poplite comes with a variety of color options. I love this red one. There also is a black and several different white versions. CONS: The first few kernels go all over the place. It’s easily remedied by covering the shoot and bowl with a kitchen towel. It also does not have an ON and OFF switch. Meaning it starts working the second it’s plugged in. PROS: It’s quick, efficient, and stays clean. 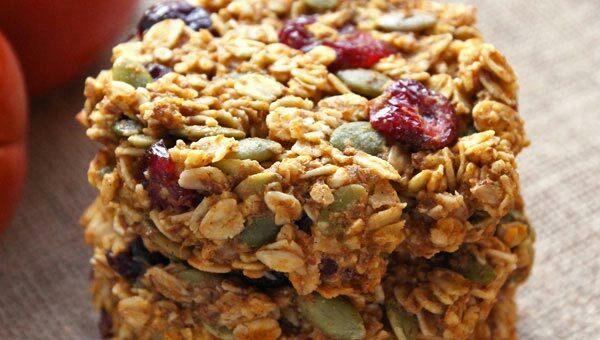 It does not require any oil or butter which is ideal for those who are fat intake conscious. With the Whirley-Pop you get stovetop popcorn at its best! The one-of-a-kind design of this aluminum pot features a clip on lid and a stainless steel stirring mechanism with a wooden hand crank that stays cool. The Whirley-Pop makes up to 24 cups of fresh, crisp popcorn at once in just 3 minutes. If you are familiar with stovetop popcorn, you know how you have to keep the pot moving to prevent burning. 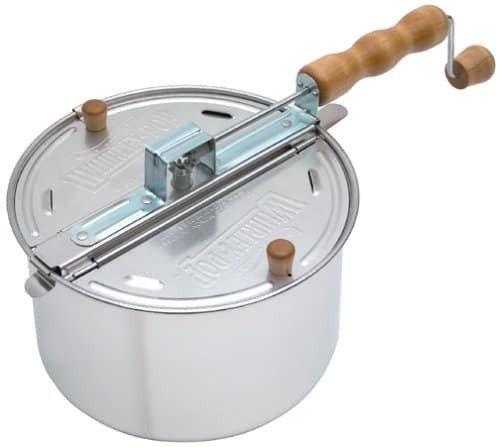 The hand crank stirring system of the Whirley-Pop makes stovetop popcorn popping a breeze. No vigorous shaking of a dangerously hot pot required. Just make sure you are using medium heat. The lightweight aluminum pot is different from most of your regular heavy bottom cookware. 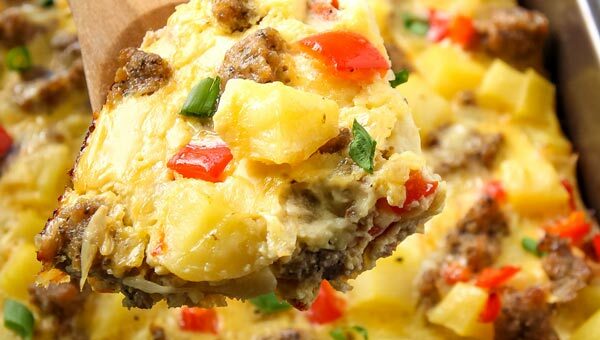 Medium heat is all it needs to heat it up quickly and evenly. CONS: It’s a touch bulky and not ideal if you have limited kitchen cabinet space. PROS: Because it’s a stove-top popper, there is no need for a microwave or even electricity. The Stir Crazy Popcorn Popper by West Bend is one unique looking appliance. I probably would never have known about it if we hadn’t received one as a wedding gift. The shape reminded me of a UFO when I first saw it. The kernels and a little oil are placed on the non-stick heating surface. A stirring rod keeps them moving to ensure even heating and no burning of popped kernels. The plastic lid doubles as serving bowl. If you place a little butter in the butter well, it drizzles over the popcorn as it melts in the popping process. We’ve had a lot fun with our Stir Crazy Popcorn Popper. My only caveat is, that it is rather bulky and takes up a lot of cabinet space. CONS: It’s a bit bulky. Not ideal if you have severely limited kitchen cabinet space. PROS: Comes with a serving bowl. The Nordic Ware Microwave popcorn popper is the way we’ve made microwave popcorn since ditching pre-packaged microwave bags. The bowl is made from unbreakable, chip-proof gemstone material with a plastic lid. I love that both parts are dishwasher safe. You can pop and serve the popcorn in the same bowl. Like an air popper, this microwave popcorn bowl requires no oil for popping. However, we found that adding a little oil to the unpopped kernels, actually results in better popcorn. There is a learning curve to making the best possible popcorn with each new appliance. With the Nordic Ware Microwave Popcorn Popper we learnt that we had to turn off the microwave before it gets to ‘1 pop per second’ as instructed in the manual. When we waited this long the popped kernels started burning. Once you’ve figured out the timing, it is very easy to use. It also is one of the most affordable of all home popcorn makers. CONS: You have to use it a couple times to learn how to get it just right. PROS: Is dishwasher safe and is a sturdy serving bowl. This Cuisinart air popper is a great looking small appliance that would make an elegant style statement in your kitchen. I’d definitely be comfortable to have this one sitting on my countertop permanently. It makes up to 10 cups of popcorn at a time. Compared to lower priced air poppers it has some really useful additional features. Instead of starting up when being plugged in, it has an on/off switch and a nifty way to roll up the cord for storage. It is also fairly quiet compared to other hot air poppers. All removable parts (the cover and butter melter) are dishwasher safe for easy cleaning. The plastic parts are BPA free which is very important when making or heating food in plastic containers. The color options include red, white and metallic red, which looks especially classy. CONS: A little pricier (granted the added features are worth it). PROS: It comes with an ON and OFF switch (most air poppers don’t). It operates relatively quiet and is beautiful to look at. This Great Northern Pop Pup Popcorn Machine gives you a full experience of movie theater popcorn at home. It not only tastes like theatre popcorn, but the machine also looks just like the popcorn machines you see at the movies. A stainless steel kettle pops the corn, which can then be inverted into a removable serving tray (which is dishwasher safe). At 9.8 x 11 x 18.8 inches, it is small enough to fit on even the smallest kitchen counter. 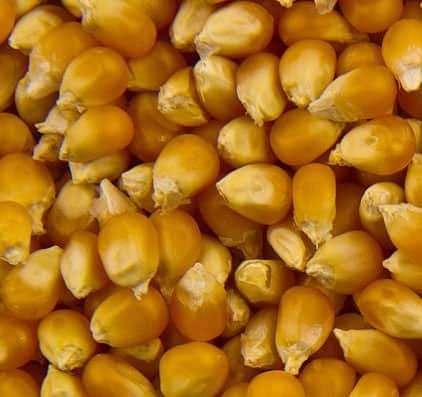 It can pop 2-1/2 ounces of kernels at a time, which makes 16 cup of popped corn. 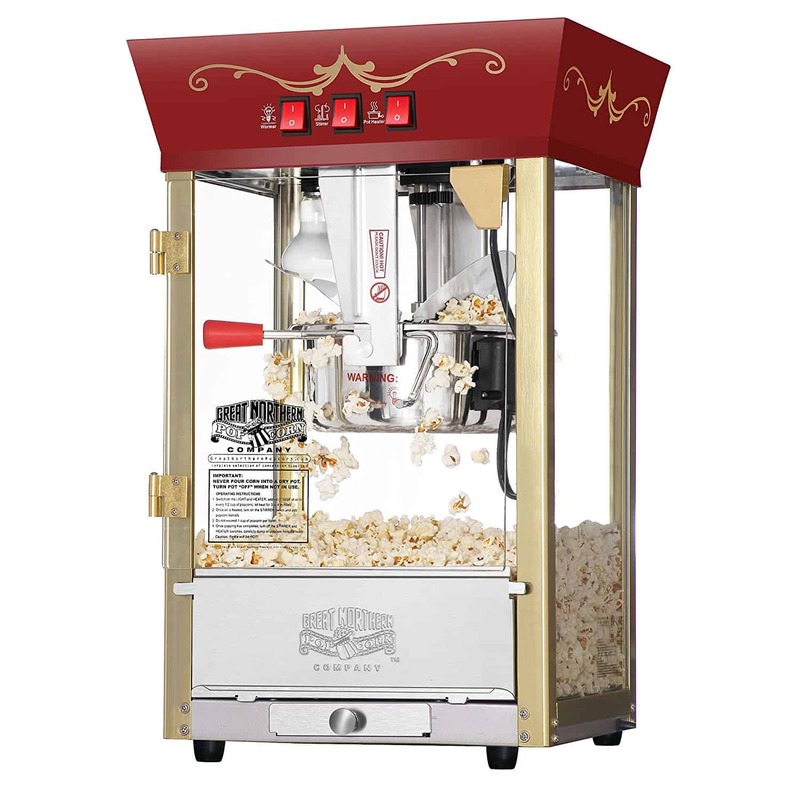 For something bigger, check out the Great Northern Movie Theater Style Popcorn Machine. This 8 ounce popper can pop up to 48 cups of theatre quality popcorn and is – technically – a commercial popcorn machine you’d expect to see at a popcorn stand. The warm keeping light is a function that is unique to this type of popcorn machine and is designed specifically to keep the popped corn fresh and warm. So – whether you run a charity event, concession stand, have a lot of friends over to watch sports, or simply like to make large amounts of popcorn, nothing makes more of a statement than one of these classy popcorn popper machines. Why Own a Popcorn Popper? If you or your loved ones like popcorn (even if you don’t regularly have movie nights at home), you should definitely own a popcorn popper of some kind. The ones listed above are THE best in their categories and respective price ranges. Of course you can buy pre-packaged popcorn bags that you throw in the microwave. Truth however is that those will not only cost you more in the long run, but will also be less flavourful and less healthy for your. So a huge NO-NO if you are at all concerned with flavour and about the chemicals you put in your body. Plain popcorn kernels (and sometimes a little oil) are the only ingredients of homemade popcorn. Pre-packaged microwave popcorn bags contain not only popcorn kernels, but also a whole list of chemical additives that can pose serious health risks. – Diacetyl is the chemical used to synthetically add butter flavor. – PFOA, the chemical used to line the microwave bags is considered a ‘likely carcinogenic’. – Trans-fat is added to imitate melted butter. Using a popcorn making appliance results in minimal waste. Pre-packaged microwave popcorn bags don’t exactly yield the largest amount of popped corn. If you are getting together with family or friends for a movie night, you likely have to use several bags to make enough popcorn for everyone. All of these bags create trash that you wouldn’t have when using a popcorn maker. If you’ve never bought a bag of popcorn kernels in bulk, you’ll be surprised to learn how affordable they are. A big bag of kernels results in a LOT of popped corn. When compared to pre-packaged microwave bags, you can save up to 70%! We make homemade popcorn several times a week and all of our popcorn makers have more than paid for themselves by this calculation. So you have decided (or maybe I have convinced you 😉 ) that you need a home popcorn maker. The next question is, which one? There are different aspects to consider when choosing the one best for you and your home. Essentially, all popcorn poppers fall in 2 categories: they are either standalone small appliances or need an outside heat source. Within the latter category, that heat source is either the microwave or the stovetop. If you avoid using the microwave altogether or just plain don’t own one, your option is a stovetop popper or a countertop popcorn machine. Among the countertop popcorn makers there are also two categories: air poppers or popcorn makers that require oil or butter. If you are avoiding fat for health reasons or you just hate the buttery texture, air poppers are the way to go. With just high heat and a revolving fan, air poppers do a great job of making fat-free popcorn. Of course you could still melt butter separately and add it in after if you really wanted to. Most popcorn machines (that require oil or butter) will automatically mix the butter in with the popcorn. Considering the size is important when deciding which popcorn maker to buy. Air popper machines are usually the smallest standalone appliance, because they require a separate bowl to collect the popped kernels. Where as the foldable silicone microwave popcorn popper bowls are the overall smallest as they can be folded and stuffed in even the tightest shelf space. 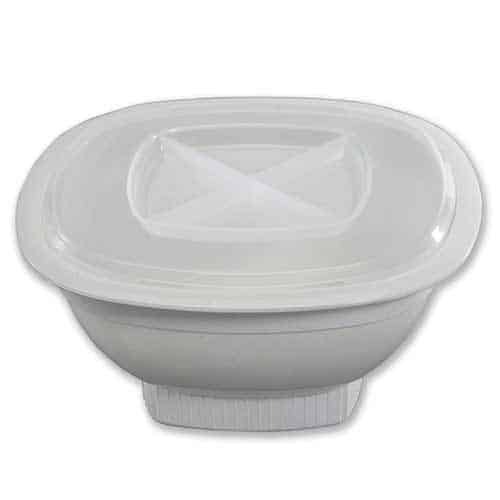 Stovetop poppers can easily be stored nesting with your other bowls and cooking pots. Theatre style countertop poppers will take up the most space. You’ll have to consider if you have counter space to spare. They look so nice that you may not even want to hide it, so there’s that. Without any extra counter space to store and display a popcorn popper, you will at least need to find some cabinet space to put it once you’re done using it. Have a look at how much popcorn you get in each batch. If you have regular family movie nights, you need a popcorn maker that can produce more than one serving. Otherwise, making enough popcorn for a family or group of friends can turn into a laborious and time-intensive activity. So much for a relaxing evening, right? You may also need to pay attention to the material the popcorn popper is made of. 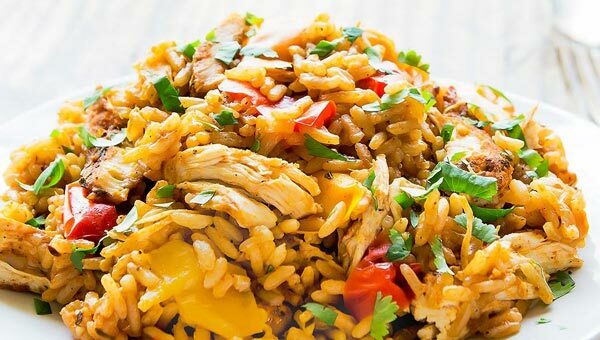 If you are avoiding non-stick coatings on your cookware or plastic in general, you want to make sure that the popcorn making appliance you are choosing isn’t made of these. Look for stainless steel in stand-alone appliances or silicone with microwave poppers. You’ve enjoyed your crunchy popcorn snack, but now it’s time to clean (and possibly put away) the popcorn maker. If you prefer not having to hand wash, pick a popper type that is in part or entirely dishwasher safe. Or choose a hot air popper that does not require much (if any) cleaning after use. With most (small) appliances, function is more important than appearance. However, the question of aesthetic appeal arises when your popcorn machine is going to get a permanent spot on your kitchen counter (see 2. Size). If you are going to see it every day, you should at least not hate the way it looks. 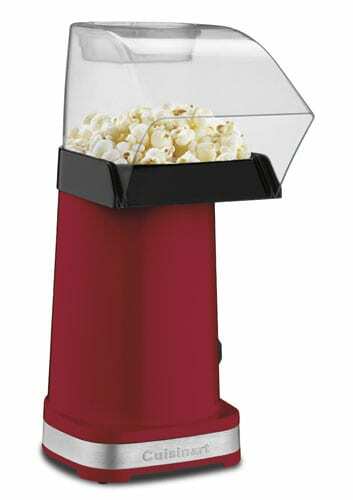 The popcorn poppers I’ve listed on this page will pop any conventional popcorn kernels you can find at your local grocery store. Since you’re ordering your popper online though, why not order a batch of popcorn kernels as well? It will probably last you a few months, but the good news is that popcorn kernels don’t go bad. Meaning it will likely still be good years later if you keep it dry. Oh and, did I mention it’s super affordable to stock up on popcorn kernels? Disclosure: This post contains affiliate links. This means that if you make a purchase after clicking on one of these links, I may receive a small commission at no extra cost to you. This does not reflect my opinion of any popcorn popper listed though. Thank you for your support in making Leelalicious possible. I really appreciate it! That is true. Although I have to yet overheat any of my popcorn makers despite using them to pop multiple bowls of popcorn in one go. For those concerned about that though, we also wrote a review specifically for bigger popcorn machines. I have the biggest popper and the inside top of machine is galvanized, not stainless steel and it seems to start to rust after several uses. So keep it wiped dry after each use. One thing I might add is: if you usually salt your popcorn, wait until it is popped and out of the popping machine so as to not get salt inside the machine. Same with salty butter. If you can, never put it inside a machine (unless it’s a plastic or silicone bowl) as it too will encourage rust on metal parts. STILL LOOKING for a 4 QT stovetop popper that’s dishwasher safe. Getting the biggest one you listed. 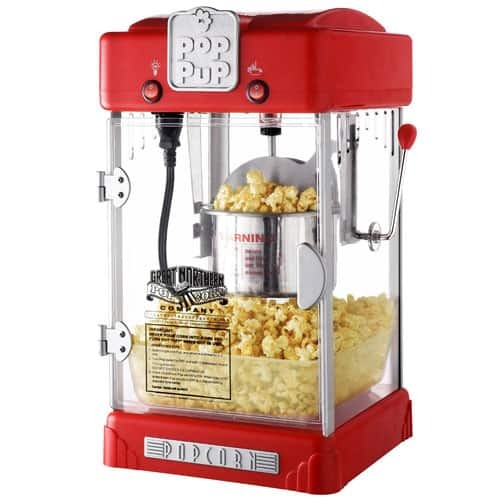 Not running a business where I need a commercial popcorn popper but I think it would be a terrific machine to have in my basement for when all the grand-kids come over or I have my buddies over watching the gray cup or Stanley cup for that matter. Winning the heart of grandkids with popcorn instead of candies is a huge win in my books. Great article Regina, I Enjoy making popcorn to my kids and family, so I like how you reviewed all the popcorn poppers types, in my opinion hot air popcorn maker is the best one, because its more healthy than other ones, it uses hot air to pop without using oil, and it help anyone making popcorn easily with no skills needed, Thanks! Yes, airpopers are definitely super easy to use. And they are one of the cleanest poppers you can use (in regards of not needing to add anything except kernels). In fact, we just recently picked up another air popper because of this. We also did a thorough hot air popper review over here and talk some more about the many benefits of using air poppers vs other types of poppers. I have done my popcorn research, and read through quite a few blog posts on popcorn makers (really 😉 ), and this is one of the most informative ones I have read-if not THE most informative. I especially enjoy the fact that you added information about environmental effect, not enough people are thinking in that way, and perhaps your article can inspire them to (or, in the very least, remind them to). 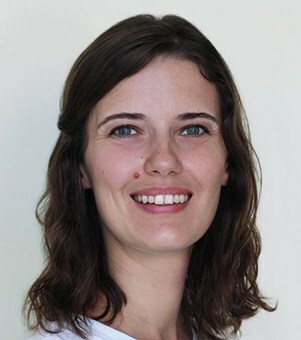 Thank you for the great article, keep up the fantastic and thorough work! I’m a huge popcorn fan, so I found your info very informative and useful. I already own an Orville Redenbacher Presto that works great. 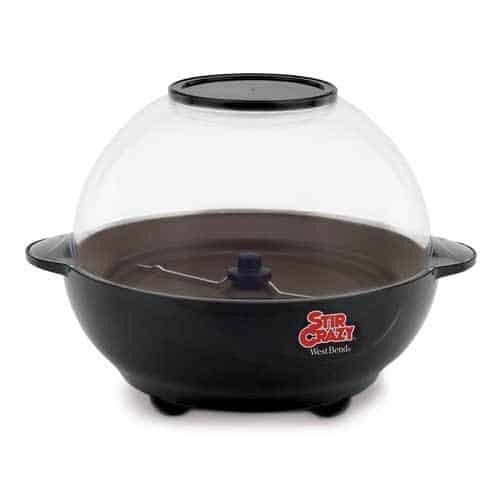 It looks very similar in design to the West Bend Stir Crazy Electric Popcorn Popper you have listed on your page. I used to do microwave popcorn until I found out some of the dangers you mention above. Once I found those out, I switched to popping my own like you suggest. Great article! Keep up the great work. Although the silicone (microwave) bowls are rated “safe for cooking”, I can appreciate when people go the extra mile to not use food-safe silicone/plastics. Same goes for microwaves. I understand they are deemed to be safe for regular use, but I use the microwave maybe once a month (at most). It’s convenient, sure. Especially for popping popcorn, but if given a choice, I avoid using microwaves as well. Anyhow, thank you for the kind comment!